New technology could make nuclear plants less susceptible to disaster, and possibly ease Japanese fears. Japan experienced two relatively moderate earthquakes on Monday morning. Both occurred off the eastern coast of Japan’s main island of Honshu, near the stricken Fukushima Daiachi nuclear power plant. Neither earthquake caused any major damage or disturbance, and there are no reports of any risk at the Daiachi plant, which experienced a meltdown after a tsunami breached its sea wall following an earthquake in March 2011. Still, the two earthquakes today highlight the need for safer technology surrounding nuclear energy, in order to withstand the impacts of natural disasters. The earthquakes both occurred within 100 km of the coast. The first was a magnitude 5.7 and happened at a depth of 22 km at 3:00 am local time. The second happened two hours later and was a magnitude 5.6, at a depth of 39 km, according to the U.S. Geological Survey. The cities nearest these earthquakes were Iwaki, Kita-Ibaraki, Namie and Hitachi. The U.S. Department of Energy has increased its funding to develop more robust protective casings for nuclear fuel since the meltdown in Japan in 2011. According to an AP report, that funding went from $2 million to $30 million after the disaster. The report indicates that some of these new designs could be implemented at test reactors as early as this summer. The goal of the research is to make nuclear fuels less susceptible to extreme heat, and to use materials that are less likely to create explosive chemical reactions during disasters. While the new technologies would not make nuclear energy fail-safe, they could give plant employees a longer time frame to prevent an accident from turning into a major nuclear catastrophe. 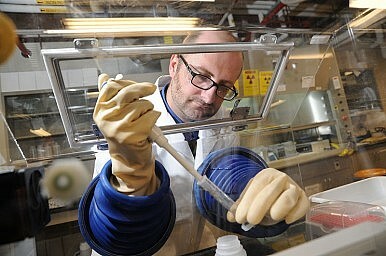 Some possible solutions include changing the alloy used in the tubes (called cladding) that encases the nuclear fuel. Instead of the current zirconium alloy, which reacted with the steam from the overheated reactors to produce the hydrogen gas that later exploded in Fukushima, the research is focusing on alloys like molybdenum, silicon carbide, or even ceramic materials which can withstand higher temperatures. The possibility of safer nuclear technology in the near future might help to ease the fears of the Japanese public surrounding the possible restart of some of their 48 nuclear reactors, all of which are currently offline. As the cleanup process at the Fukushima Daiachi plant continues to pose significant, long-term problems, the public will need assurances that plant employees will have the time to safely shut down nuclear reactors in the event of a natural disaster.